We’ve reached the seventh and final post in our Modern CFO series. From KPIs & reporting, planning for growth, and communicating financial information to achieving auditability, handling compliance, and keeping your company’s data secure, we’ve addressed CFOs’ top technology challenges and finish with a look at Artificial Intelligence, Machine Learning, and how both help provide strategic insights and better decisions. Chief Financial Officers have always played an active role as an advisor for business owners and CEOs. Bringing together information from every area of business—sales, marketing, human resources, operations, accounting—is a skill that makes the Modern CFO unique among business executives. What makes today an even more exciting time for CFOs is the available technology and business accounting software that can aid and enhance decision making. In the 1990s, Enterprise Resource Planning systems were introduced. ERP software gave CFOs the ability to look at an entire company from within one software program for the first time. Over time, the amount of data has grown exponentially. Now, with the integration of Artificial Intelligence (AI) and Machine Learning (ML), CFOs can analyze a wealth of data and information quickly and offer more strategic guidance than ever before. AI uses the power of today’s computer systems to perform tasks that normally require human intelligence. ML uses algorithms that allow financial software applications to learn by being trained to identify key patterns. Both have matured to the point where now they have become key financial management technologies used by the Modern CFO. While most ERP systems feature dashboards that can provide real-time information on everything from inventory turnover to employee productivity, dashboards can’t tell you when to re-order inventory or hire your next employee. This is where AI and ML can be an essential tool. Using your ERP system, you can quickly gather data and generate reports with the push of a button. But ML can take data gathering one step further and help CFOs reduce repetitive tasks and make more strategic business decisions. AI can help automate complex processes, identify future trends based on historical data, and provide an unbiased view of performance. Using AI and ML, your ERP system can become more predictive, telling you during which weeks of the year you sell the most inventory and what types of inventory have the highest profit margins. While ERP systems can sift through and organize information into useful reports or alerts, it’s still up to the Modern CFO to extract the data needed to make important business decisions. ML can help CFOs identify patterns, trends, and disparate connections that a human eye might otherwise miss, including external data that can impact an organization’s performance, such as weather patterns, natural disasters, and commodity prices. Accounts Payable/Receivable: AI systems can read invoices, automate the approval workflow, and streamline the payment process. Procurement: AI can track price changes among suppliers and identify the optimal provider at any given time. Audits: AI can quickly gather journal entries and provide an audit trail of all transactions, automatically evaluating the numbers. Monthly/Quarterly Close: For financial reporting, AI is being used to gather data from multiple sources, consolidate the information, and aid in reconciliation. The vast amount of data being generated in your company keeps growing and is getting more complex by the day. 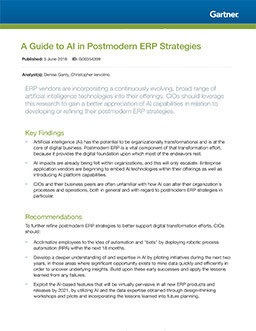 This overwhelming amount of information presents an opportunity for the Modern CFO to gain more strategic insights by pairing their ERP system with AI and ML. If you’re in the market for the right ERP software, contact our team with any questions about Acumatica’s cloud ERP software or to request a demonstration. You can also check out our highly-rated Acumatica Financial Management edition and our Reporting, Dashboards, and Data Analysis Toolkit for further information.